Manage Initiator Group > New Initiator Group. Call the group whatever you’d like. Highlight the host > Configuration > Storage Adapter > Highlight your iSCSI Software Adapter > Details > Copy the IQN (Also called the WWN or World Wide Name), and paste it into the initiator iqn field. There’s no need to add an IP Address for this connection, the iqn will be good enough. Environments may vary. Do this for all of the hosts you’ll be adding to this group. A volume will need to be created and your new initiator group will need to be applied. In the Nimble Management Console, head to Manage > Volumes > New Volume. From here, you’ll enter the details of the volume. Name it whatever you’d like, making sure to adhere to the naming policy, something easy like datastore1 will work just fine. Make comments so you know what you intend to put on the volume. Your performance policy will matter, depending on what version of ESXi you have. “VMware ESX” will be used in my tutorial because I’m using a VMware version less than “VMware ESX 5” – nice and simple, but remember the block size of the volume will not be able to change after the volume is created, so you won’t be able to jump from one policy to another. 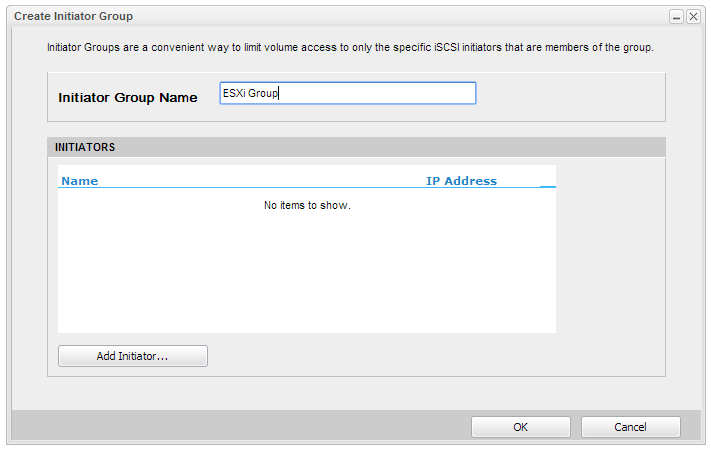 For Access Control, bubble in the option to limit access, check the initiator group, choose the group you created, and check “Allow multiple initiator access” if you want more than one host accessing the volume. Otherwise, the volume won’t be seen by other hosts after you’ve added the volume to the first host. Enter a size for the volume. In my example, I’m going to leave reservations and whatnot default and just add the size and click Next. Feel free to adjust your reservations and snapshot information if you’d like. Regarding Protection: “Protection” as Nimble calls it, is referring to the snapshot schedule you give volume collections. Snapshots done at the SAN level can be scheduled here. Nimble does an amazing job at snapshots, compression, and replication. I’d suggest you look into this in the future. For now, since we are getting this volume attached to hosts quickly, I’m going to skip this by saying None. Nimble will “yell” at you in red. This is OK, you can proceed, but know you should return to this later on, especially if you have no other method of backing things up. Volumes assigned to a volume collection are protected according to the volume collection’s protection schedule. Standalone volumes can be protected using a protection template or by creating a custom protection schedule. That said, you’re better off creating to vmkernels and attaching one nic to each of them. Here’s a screenshot of one. Best practices says to use two for more paths and redundancy. Be sure to give it an IP address on your data network (You separated your data and management network, right!?). Just because you created a vmkernel and gave it a physical nic to play with doesn’t mean it knows you want to use it with the iSCSI Software Adapter. It needs to be bound to the software adapter. You can do that by doing the following. Get the vmkernel name, in my screenshot it is “vmk4” and the vmhba ID, which you can find at Configuration > Storage Adapters > iSCSI Software Adapter, which in my screenshots above is vmhba32. With that knowledge, run the following command. Do this for all of your hosts. Click Storage Adapters in the Hardware panel.The list of available storage adapters appears. Select software or dependent iSCSI adapter, then click Properties. Click Add, then select a VMkernel adapter to bind with the iSCSI adapter.Note: You can bind the software iSCSI adapter to one or more VMkernel adapters. For a dependent hardware iSCSI adapter, only one VMkernel interface associated with the correct physical NIC is available. Click OK.The network connection appears on the list of VMkernel port bindings for the iSCSI adapter. VMware needs to know where to look. You have a discovery IP Address assigned in Nimble, you just need to tell VMware about it. If you forgot, the Discovery IP is located at Manage > Array > Edit Network Addresses > iSCSI Discovery IP. Show below. It will have an IP Address on your Data Network. Once you have it, add it to each host. Highlight a host > Configuration > Storage Adapters > Details > Properties (Far Right) > Dynamic Discovery Tab > Add. You can leave the port the default at 3260. 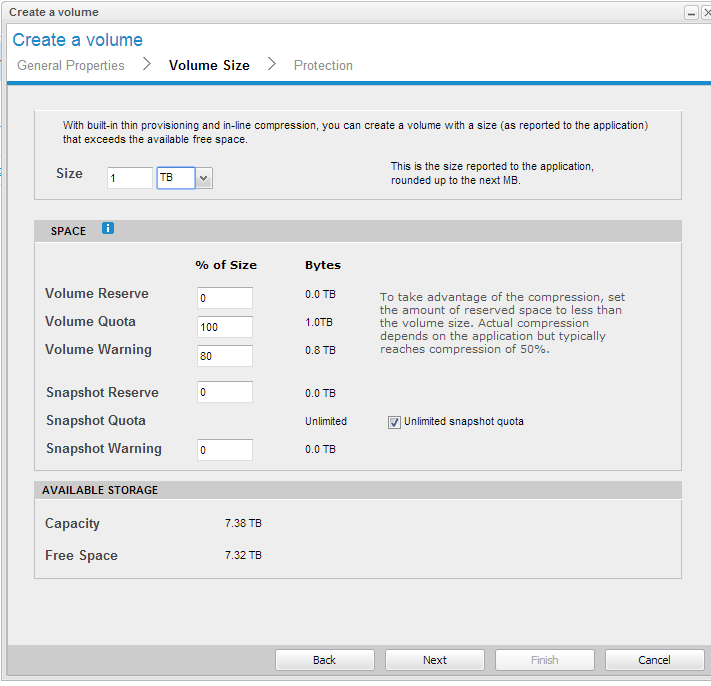 You can now discover and add the storage volume you created on the Nimble. Do this by Rescanning HBA. Highlight a host > Configuration > Storage > Rescan All at the top right > OK.
Give it time to scan and then Add Storage. Your storage is ready to use at this point, but Nimble strongly suggests using Round Robin as your path selection. You can change this at any time once the volume is added. You’ll need to do this to every host. This is a very minimal way to get storage presented to your hosts. Please keep in mind that many of these steps will need to be done to every host. You’ll also want to look into get more detailed in regards to snapshots, volume collections, proper volume policies, etc. I hope this helps some of you. Let me know how it goes. Feel free to comment if you have any questions.